Nebraska is in the midst of a wind power boom– it’s one of seven states on track to double its installed wind farm capacity in the coming years. Like many rural communities across the U.S., this has brought wide-ranging benefits to the state. “Wind energy, the fastest-growing source of electricity in the U.S., is transforming low-income rural areas in ways not seen since the federal government gave land to homesteaders 150 years ago,” the Omaha World-Herald reported. 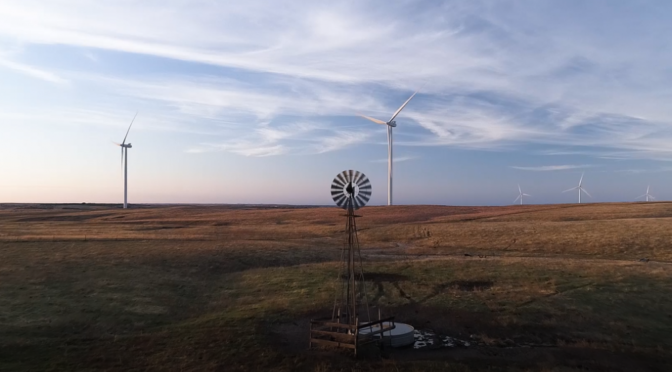 “As commodity prices threaten to reach decade lows and farmers struggle to meet debt payments, wind has saved family farms across a wide swath of the heartland. Over 99 percent of the American wind turbines fleet is based in rural communities. These wind projects bring huge economic benefits to towns across the country, like job creation, lease payments for farmers hosting turbines, and new tax revenues that support local infrastructure and fund law enforcement. We recently traveled to Nebraska to hear firsthand about the opportunities wind is creating there. In Antelope and Holt counties, about two and a half hours northwest of Omaha, the local wind projects have helped keep these close-knit communities together. By creating new quality jobs, many younger residents have been able to earn gainful employment without leaving the countries. These new opportunities to make a decent living have helped keep people from leaving their homes and families in search of employment elsewhere. Tax payments from the wind farm are expected to bring in substantial new revenue that will help fund schools, the fire department and the county government. Only a few miles up the road in Holt County, new revenue from the wind farms is helping O’Neill High School expand its facilities. The school intends to add additional classroom space, a new gymnasium, a new band room, and other educational amenities. The new jobs and investment in the two counties have also led to a huge economic boost for small businesses throughout the communities. Cathy Koenig, an employee at Bomgaars Supply, noted that sales have increased dramatically since the wind farms arrived. This helps local businesses stay open, keeping rural towns vibrant. On top of the economic benefits that come with new wind jobs and tax revenue, farming towns have also benefited from land lease payments. Wind has become a drought-proof cash crop for farmers and ranchers all over the country, delivering over a quarter billion dollars to rural landowners in 2017 alone—a hedge against poor crop years and hardships caused by fluctuating commodity prices. Bill Tielke, Holt County Board Chairman agrees. He notes that land prices are high, and it is sometimes difficult for local farmers to buy more land to bring family members back to the farm. Leasing small portions of their existing land for wind turbines can help offset labor expenses to help keep farms going. These great success stories from Northeast Nebraska are just a glimpse into the ways wind power is contributing to rural America. Luckily, the future is bright for wind in the state. Over the next year, Nebraska’s wind energy capacity is on track to double—providing even more jobs and investment for the state and its rural communities.